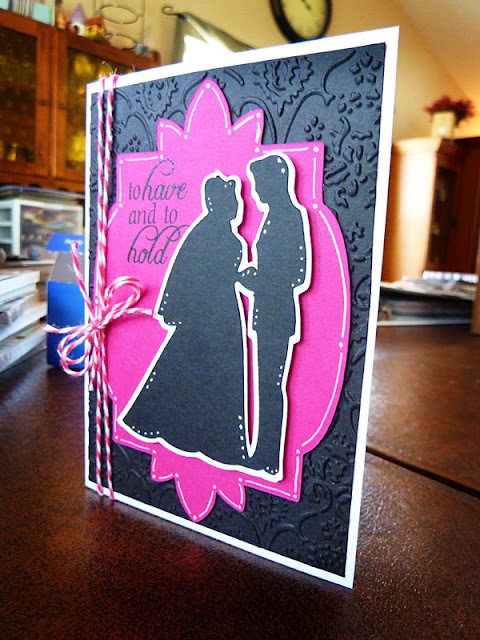 Last week, I remembered at the last minute that I hadn't made a wedding card for a friend whose wedding we were attending! So...I pulled out their invitation as inspiration, and this is what I came up with. 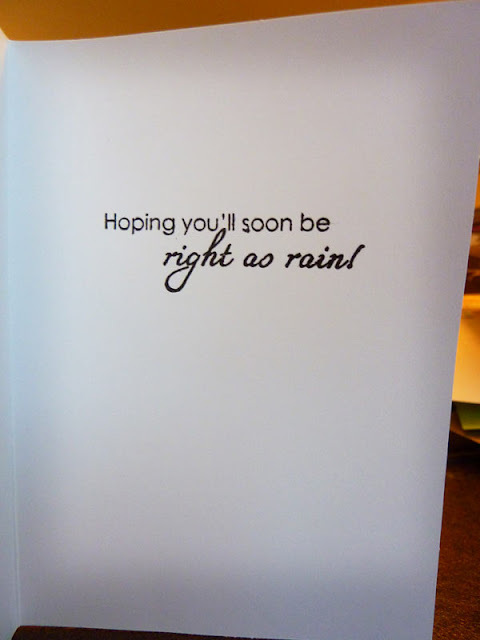 Sorry - I meant to take a pic of the invitation so you could see it, but I can't find it right now! The colors were black, white, and hot pink. I had a really hard time making the colors show up correctly in the pictures, so this is the best I could get! The background is black, and I ran it through my Cuttlebug. 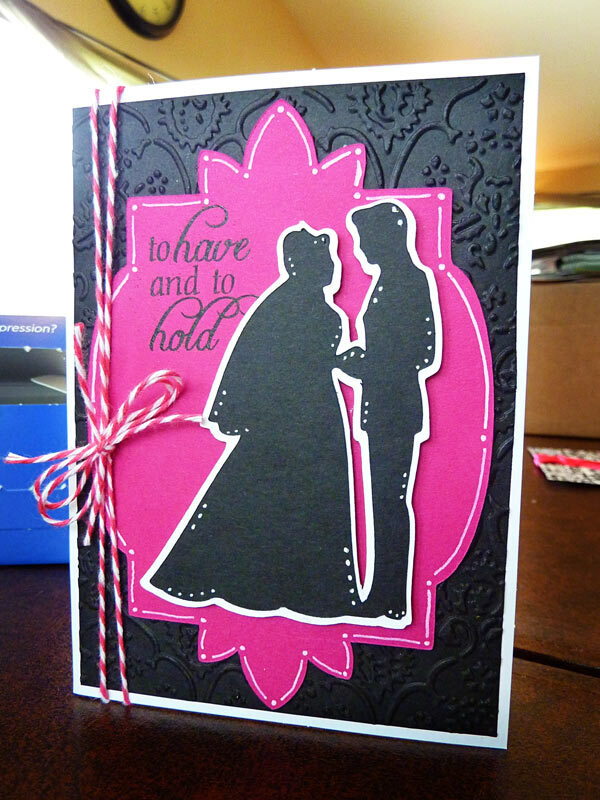 The pink frame is cut from Elegant edges, and the bride and groom are actually Cinderella and her Prince cut from Disney Happily Ever After cartridge, using the Gypsy to hide all but the outline. The sentiment is from a stamp set by 40:31 Creations, and I finished off with some Baker's Twine and some doodling with my white gel pen. Inspiration Challenge - Built a House! 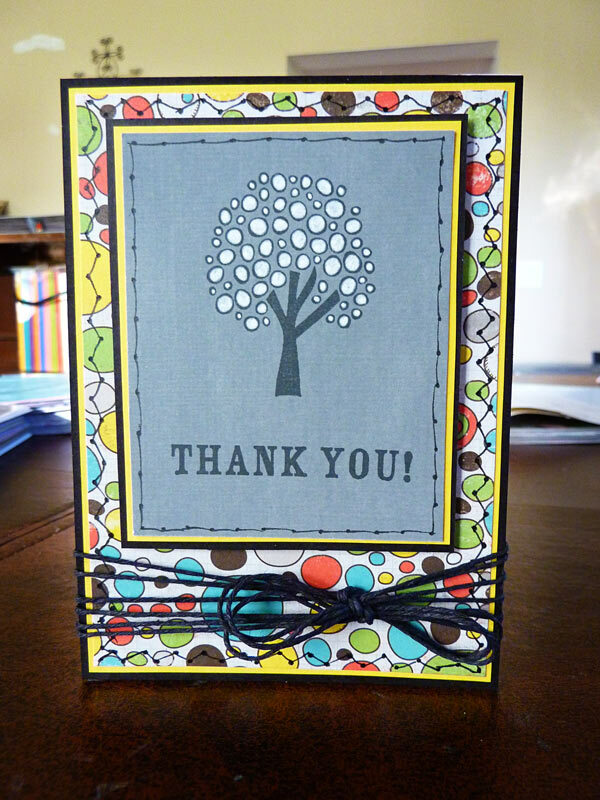 First off, I want to say that this card is very special to me! 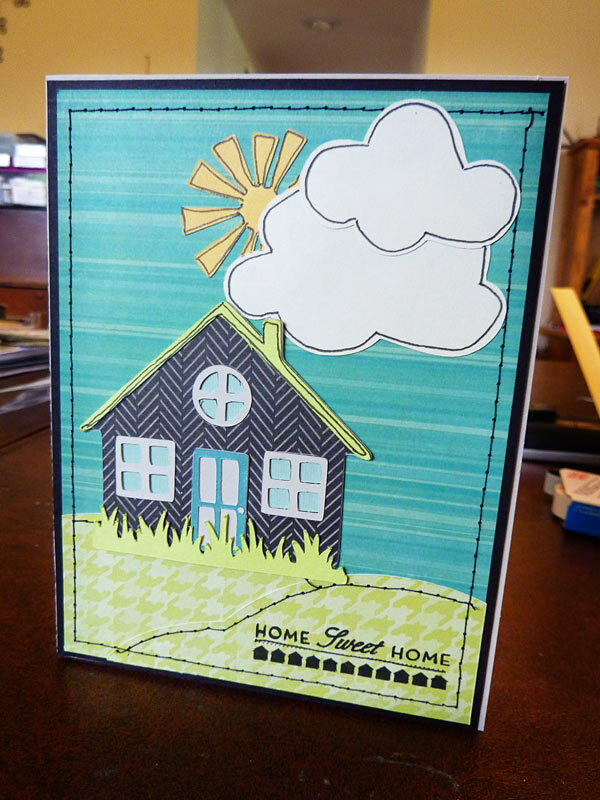 This past month, I sold enough cards to build my first house for a widow in Burundi!!! Yep...$600...and a women and her children if she has any, have a roof over their heads, dignity restored, and living proof that because of the Lord, a miracle can happen! So, I wanted to make a card to enclose the check I will be mailing to Sister Connection. And here is my take on it! I used a LOT of cartridges on this one! The house came from Kate's ABC's, and the hills were from Country Life. The grass is cut from Zooballoo. The sunshine is from Give a Hoot, and is actually one of the flower icons, but it looked like it would make such a cute sun that I had to give it a try! The clouds are cut from Pooh and Friends. 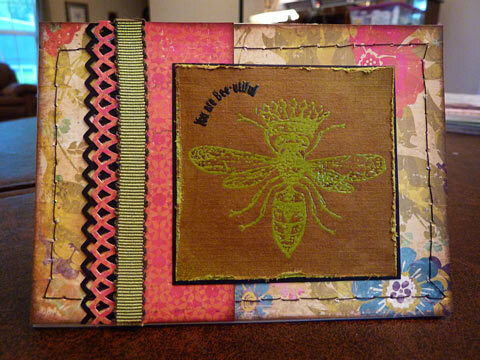 I did some more machine stitching, a bit of doodling, and finished off with a stamped sentiment from my stash. Good morning! 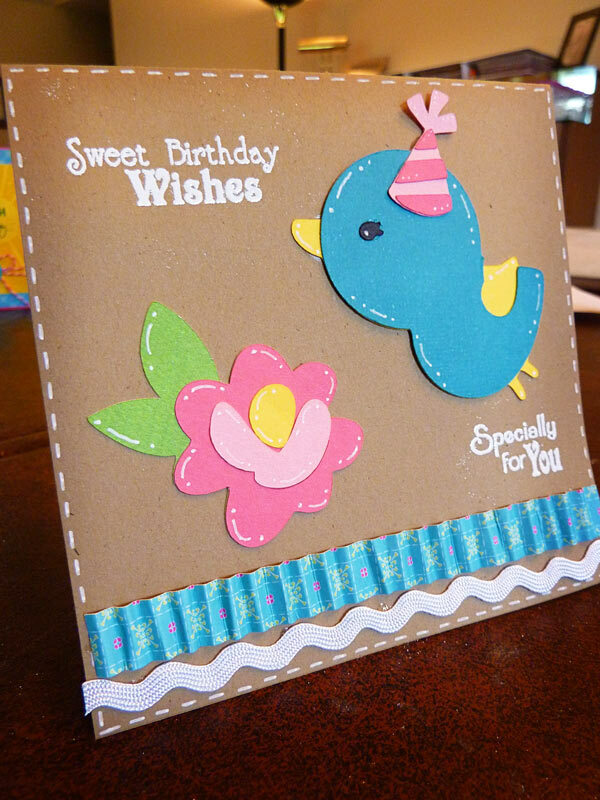 Today I have a card for Peachy Keen's LFIF Challenge: Make whatever you want with your favorite Peachy Keen Faces!!! Well...I don't think I could pick just ONE favorite! 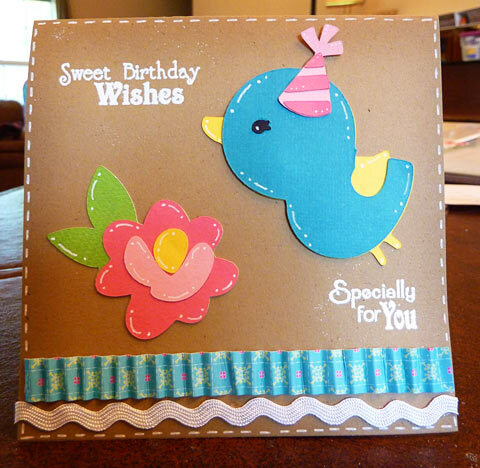 All the cuts for this card are from Birthday Bash. 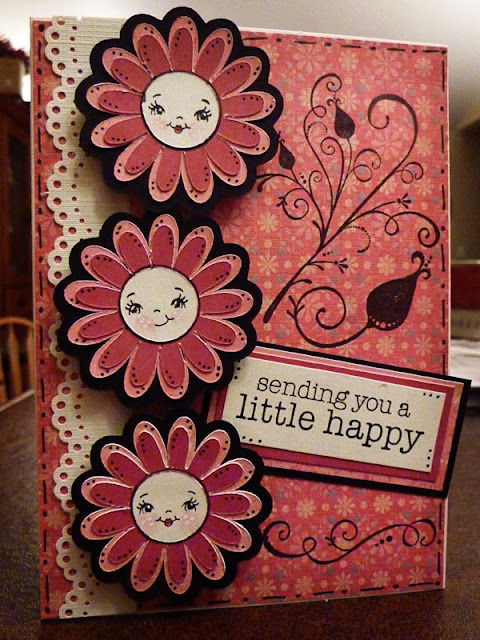 Sentiment is Pink by Design. The bunny has a Peachy face from the Critter faces in medium, and a tiny bow out of Baker's Twine. Added LOTS of faux stitching, and some stick on pearls for the corners. Friends with Flair - machine stitching! Welcome to Friday - and Friends with Flair over at the Unity Blog! 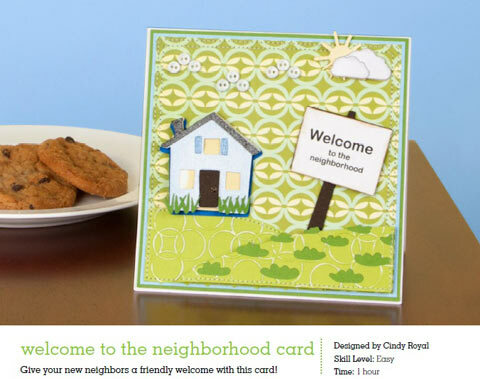 Click to go over and play along, and have 2 chances at winning some fabulous Unity stamps! Last night I pulled my sewing machine out of the back room (where it has sat for far too long!) so that I could tackle some repairs and alterations on a few little items of my girls that need it. 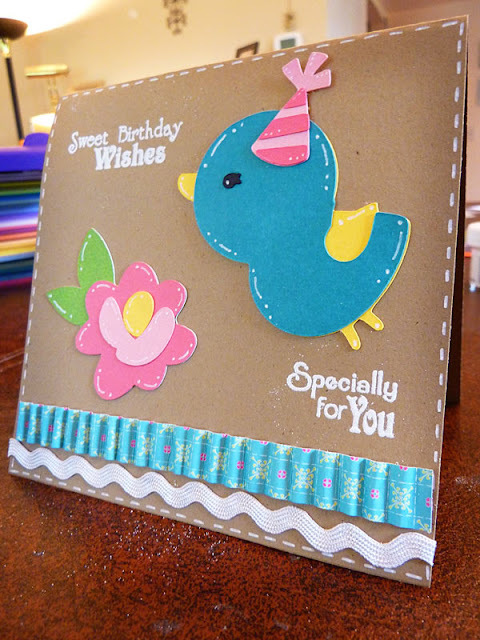 So...since it was out anyway, and I have been wanting to try sewing on a card - I decided to give it a try! Here is my first attempt! 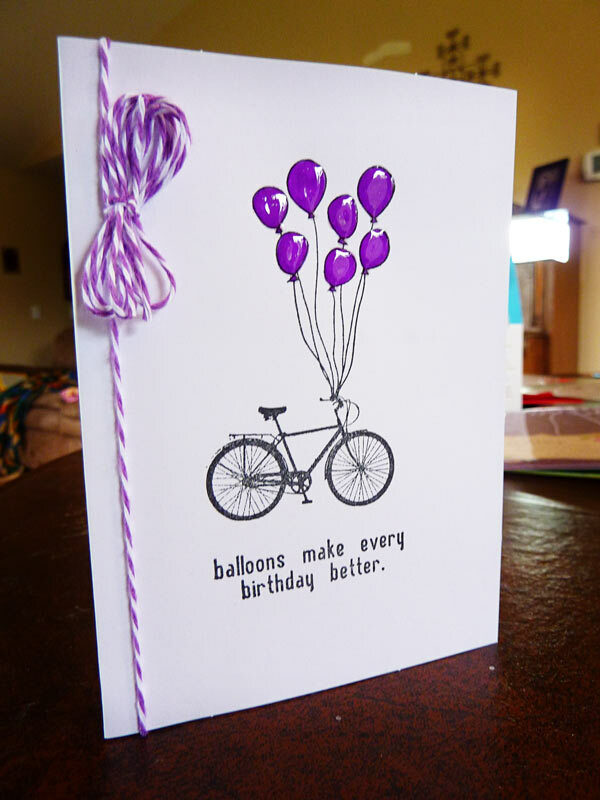 It happened to have purple thread in it, and I was too lazy to change it, so that is why the card has so much purple on it! 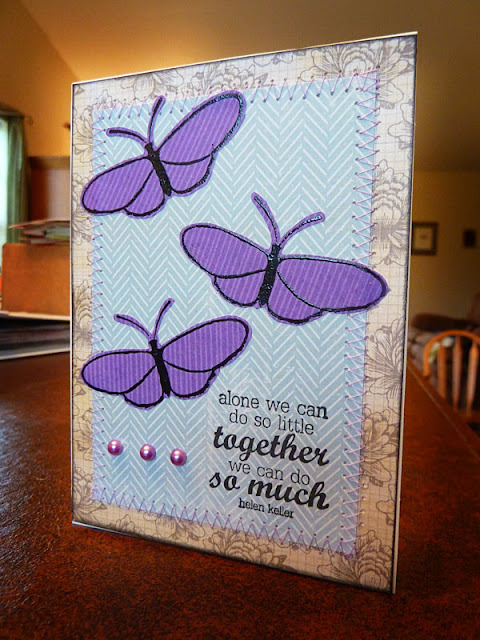 I stamped and heat embossed the butterflies, then cut them out and glued them on the card, then added the sentiment and some stick on purple pearls. 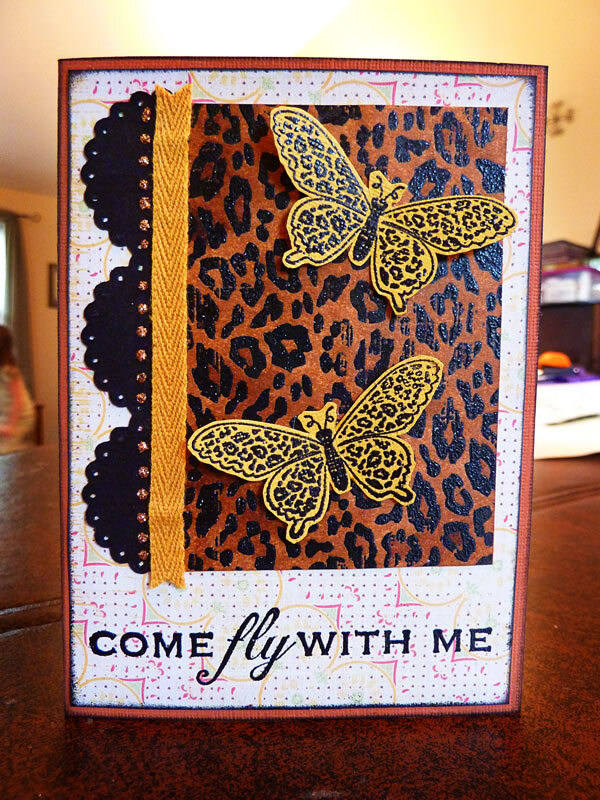 The butterflies are from the February KOTM, and the sentiment is from the March KOTM. Just have a super simple Father's Day card today featuring My Creative Time stamps. I cut the frame shapes from Once Upon a Princess, inked the edges, added some buttons and jute twine, and pop-dotted it from the background. Easy Peasy! A simple quick card today using one of my favorite Unity Stamps - and I hadn't even used it yet! 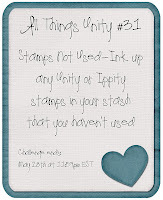 So...I am entering this in the Stamps not used challenge over at All Things Unity. I stamped this image in black on white cardstock, used my one and only copic, shadow blue, to outline the curls of fleece, then used a Prismacolor marker to color the face. 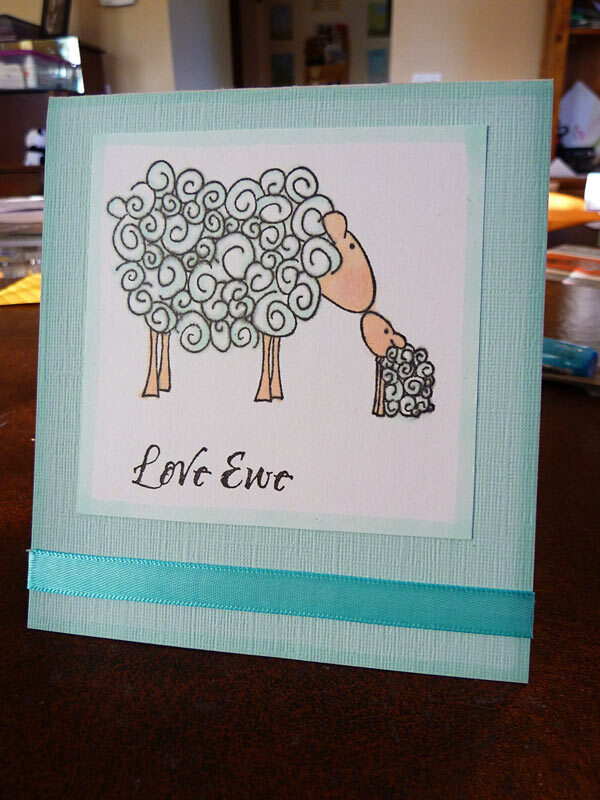 Also dipped my finger in some light pink stamping ink, and rubbed some rosy cheeks onto the sheep! 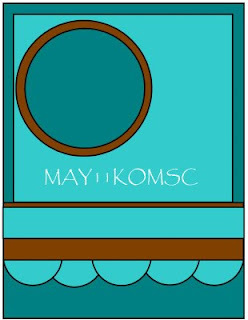 Finished off by using the wide end of the Copic marker to outline the edges of the white cardstock, and the blue base of the card, and added a bit of ribbon. 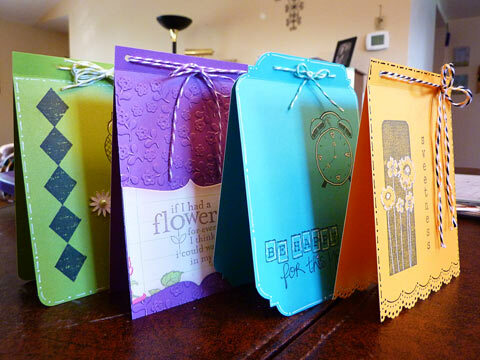 A few weeks ago I picked up a set of cards and envelopes from Michaels in all kinds of bright fun colors. I was disappointed, however, when I arrived home, and realized that the notecards were just single squares of cardstock - more like a postcard! So, I had to find a way to make them work as traditionally opening cards. I made a score mark on the top of one, stuck it down to another, added some hole punches, and threaded some twine through them. Then I got out my Unity Stamps, and just played! There is a random assortment of stamps used on these, which I won't try to figure out and list or I will be here all morning! 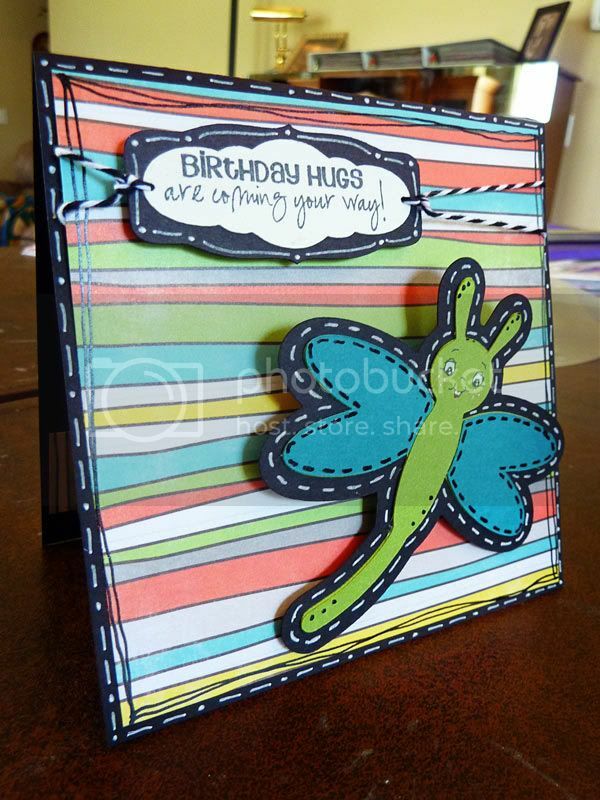 I also used some corner punches, some edge punches, a tag, my Cuttlebug, and my white gel pen to do lots of doodling! This last week, my best friend ended up in the hospital with an infection, and as she was released from the hospital, her mother was admitted and ended up having her gall bladder removed!!! Since both of these gals are very special to me, I wanted to make a card to let them know I was thinking of them! I spent the time my friend was in the hospital watching her 3 little boys, so I wasn't able to get these made until she was home and starting to feel better, but better late than never, right? Anyway, for these cards, I pulled out my new Kate's ABC's - that I FINALLY got last week, and cut out these cute little umbrellas. 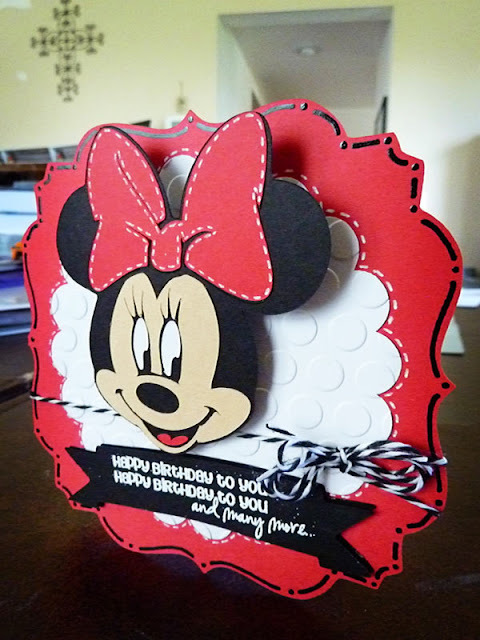 Covered them with Glossy Accents, and glitter, then pop-dotted them onto the white frames that I cut from Elegant Edges. Added a sentiment for the outside and inside from Scrappy Mom's stamps and heat embossed them so they shine a little! Finished off with a little more Glossy Accents and glitter around the edges. It was getting a little dark when I photographed these, so they are a lot brighter and more fun in real life! Had a hard time getting a good picture, so had to settle for these! 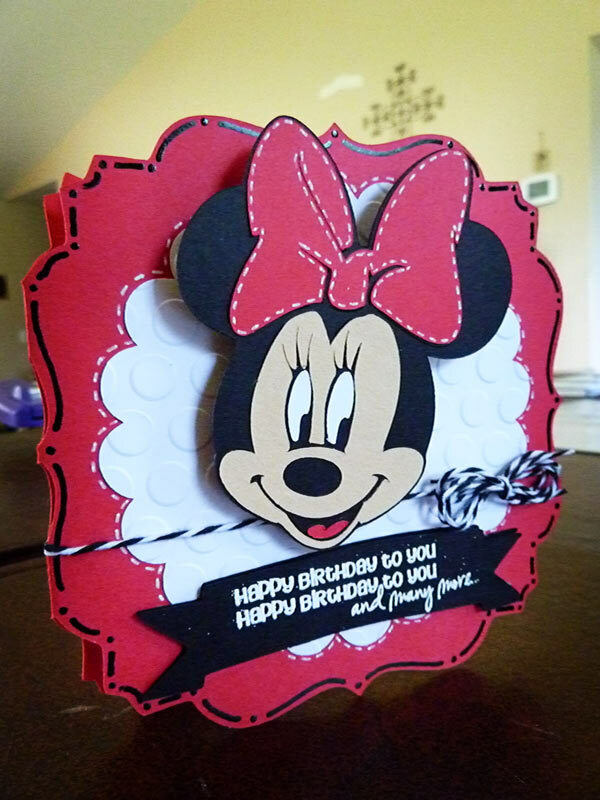 Happy Birthday to my sweet little niece! Today we get to celebrate my sweet niece Jozalyn's 5th birthday!!! This is the card I made for her! Can't wait to give it to her!!! 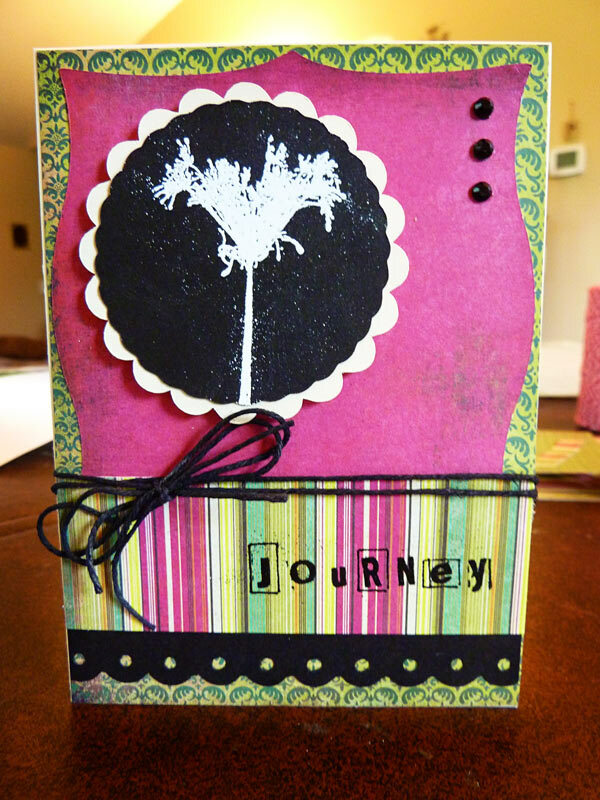 The card base is from Twinkle Toes, welded on my Gypsy. The banner is also cut from that cartridge. 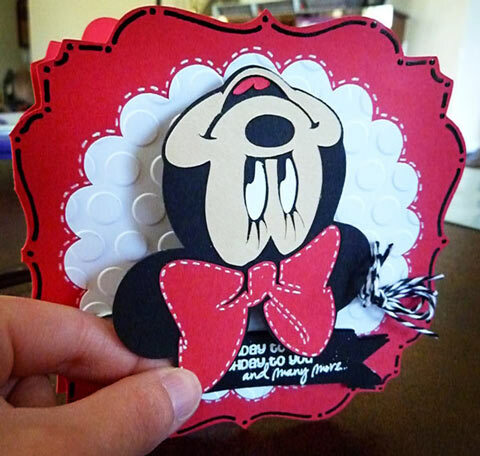 The sentiment is from Emma's My Creative Time stamps - and Minnie is cut from the Mickey Font Cartridge. I put her on an Action Wobble - those make everything so much more fun! 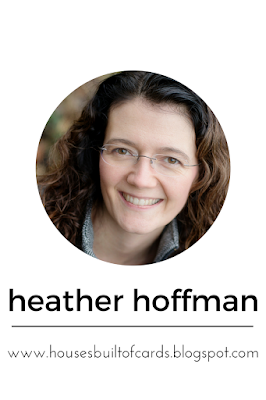 The white background came from Elegant Edges, and I ran it through the Cuttlebug. Added lots of doodling, and some Baker's Twine. I didn't take a new picture to shoe this, but after I took this picture, I put some Glossy Accents on the eyes and nose, and some red stickles on the bow in her hair! Just a little extra sparkle! Friends with Flair - Cherries!!! Good Friday morning!!! I made a card last night for the monthly Unity Challenge: Tooty Fruity, and thought it would be a great post for Friends with Flair as well! I started by cutting the white frames with my Cricut, using Elegant Edges. 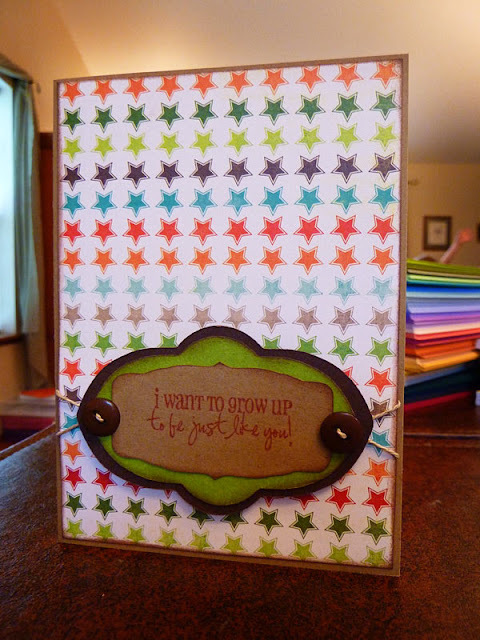 I love the look of the Spellbinders frames, how it cuts and embosses. However...since I don't have any, I decided to try to recreate it by just cutting the frame out two times in white, in slightly different sizes. I really like how it turned out, so I will probably be doing that a lot more in the future! 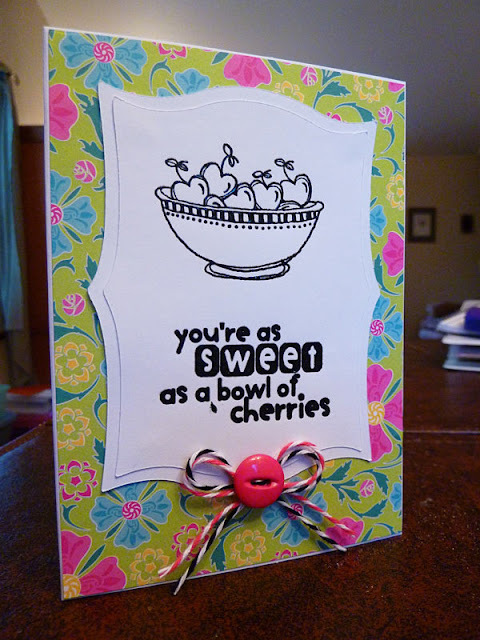 I then stamped and heat embossed the image and sentiment from the Sweet as a Bowl of Cherries Itty Bitty stamp from Unity Stamps. I planned on coloring it in, but I ended up loving the simple glossy look of the image when it was embossed, and just couldn't bring myself to ruin it! Finished off with a button, and a simple little Baker's Twine bow. This is a short post today! I'm out the door early this morning to babysit for a friend who is in the hospital. Hopefully she will be home this morning, and feeling much better!!! This is my first background stamp from Market Street stamps, so I decided to keep it simple for my first time playing with it. 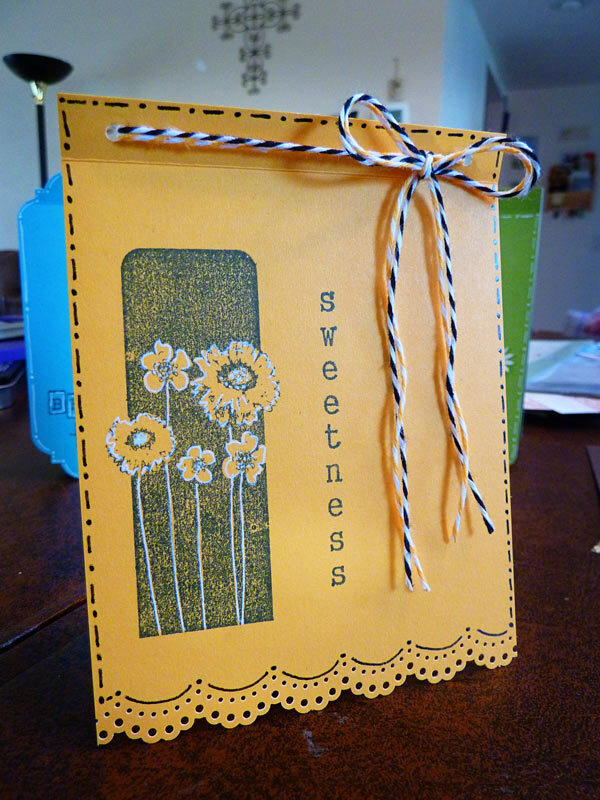 For this card, I used clear watermark in on the sunny yellow background, and heat embossed it with clear embossing powder. 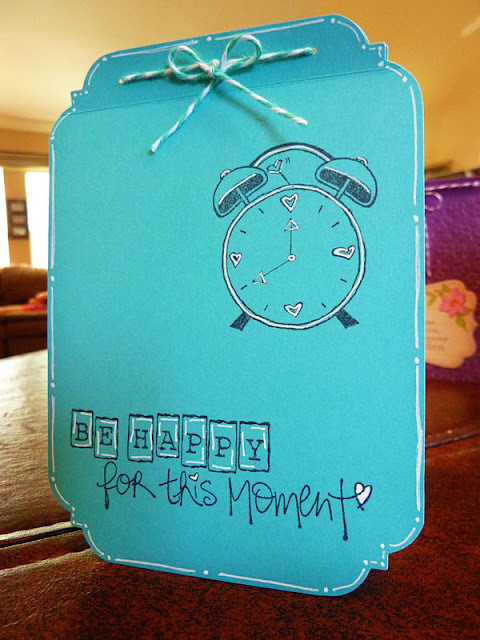 Added a sentiment in the center from My Creative Time stamps in blue ink, and embossed that with clear powder as well. Finished off with a bit of Baker's Twine and a button. 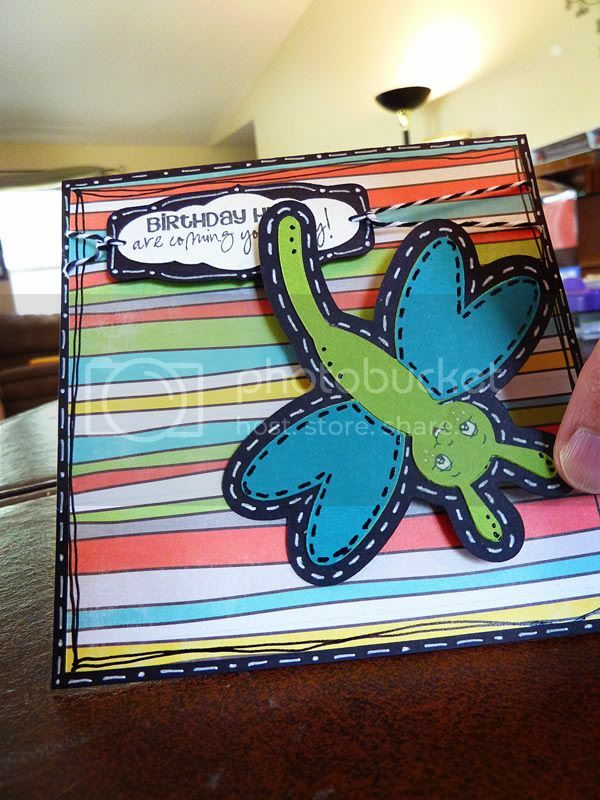 This is another card I made playing with heat embossing. 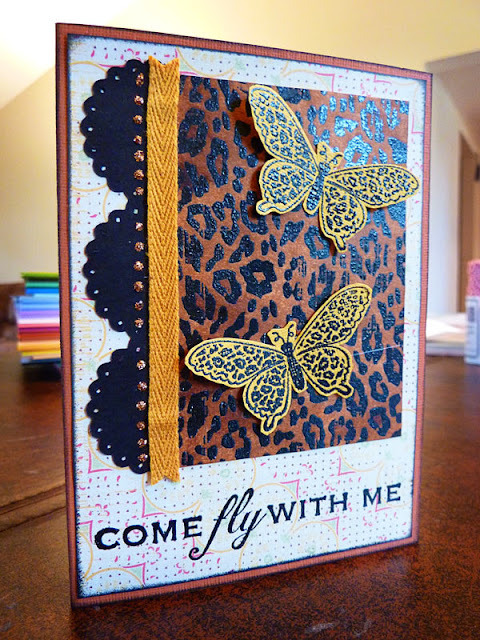 The leopard print background, and the butterflies both came from the Unity Stamp March KOTM. 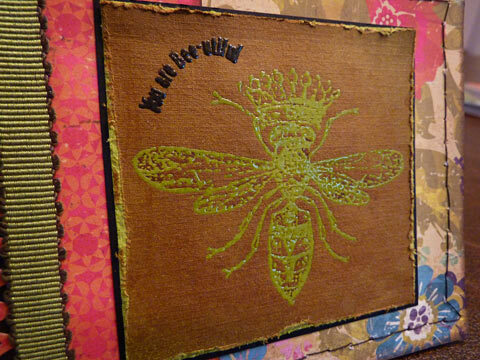 I embossed the leopard print on cream colored paper, then sprayed it with Walnut Ink antiquing solution. 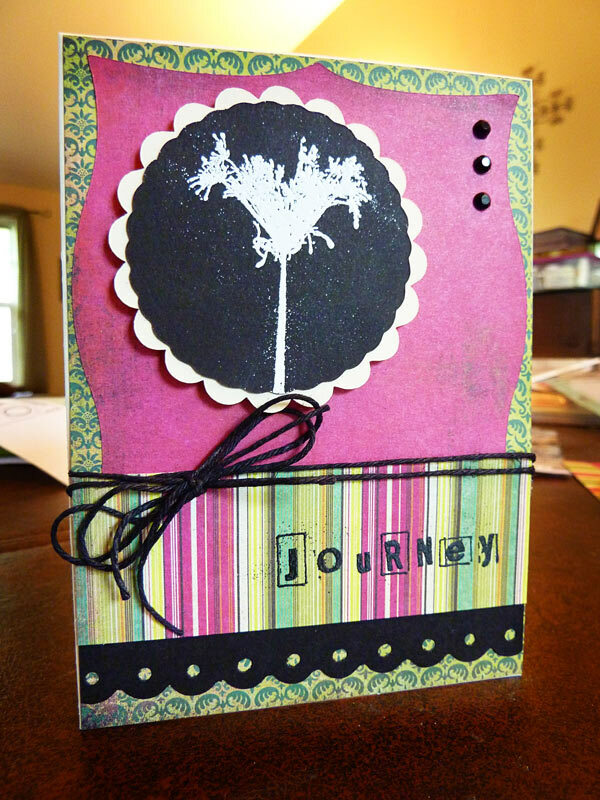 The black border along the side is cut from Elegant Edges, and there is a bit of Stickles along the side of that. Also did some inking, added a bit of ribbon, and a sentiment that came from my random winning from Friends with Flair. Almost forgot...I am also entering this in the Stamps not used challenge over at All Things Unity. 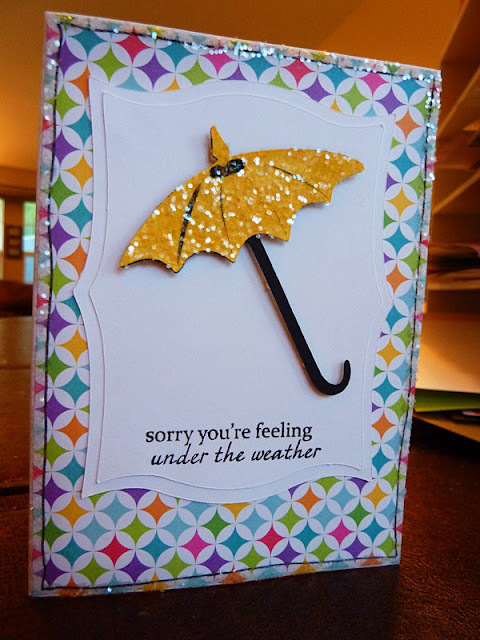 This morning I saw a Worst or Ugly Card Fun Challenge over at Scrappin 3rdeeschik, and immediately thought of this card! I don't know why, but I really NEVER liked this card, so I never posted it...but this seemed like a good chance to share one of my less favorite cards! I know the flowers came from Sweet Treats with Peachy Faces on them. 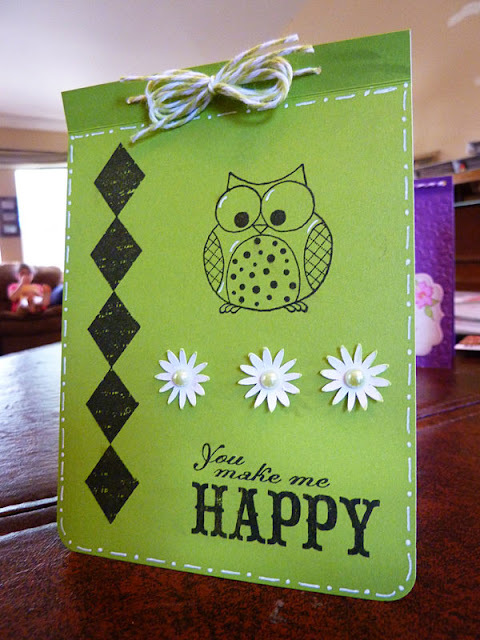 The sentiment is from Unity Stamps, and the edge punch is a Martha Stewart one. The stamps were some random ones from my stash, and I did a little doodling. I used the March KOTM - one of my favorites! 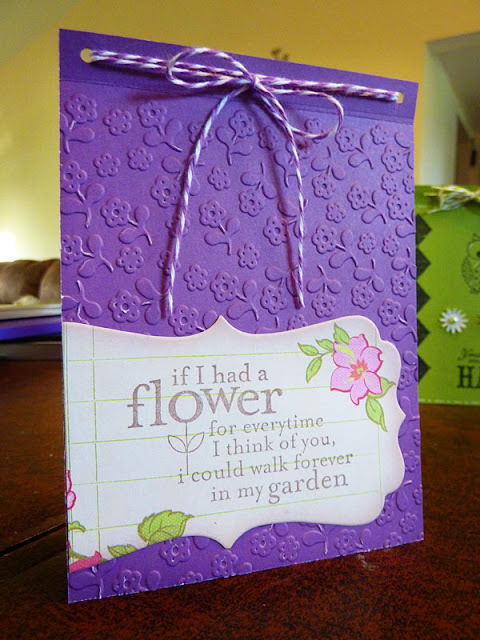 I LOVE this flower image, and it is so perfect to emboss! I had been wanting to use this sentiment as well, so I took the opportunity on this. I cut the frame and circles from Elegant Edges, added a punched border with my Fiskars edge punch, and finished off with a bit of Jute cord and some bling using my Jolee's heat set tool. Hello! I just realized that I almost was going to miss the Scrappy Mom's Terrific Tuesday's Challenge deadline - using Once Upon a Princess - so I decided to whip this together really quick! 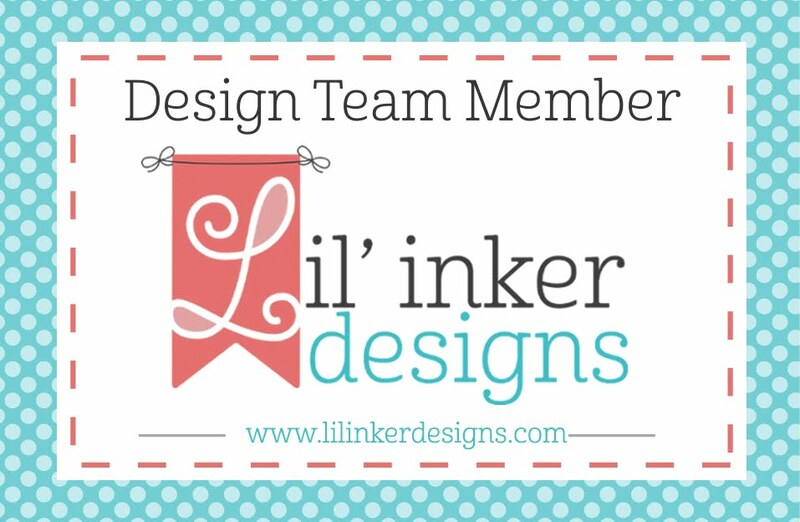 I also have been wanting to do the monthly challenge over on the Cricut Circle Blog, so I decided to incorporate that as well. 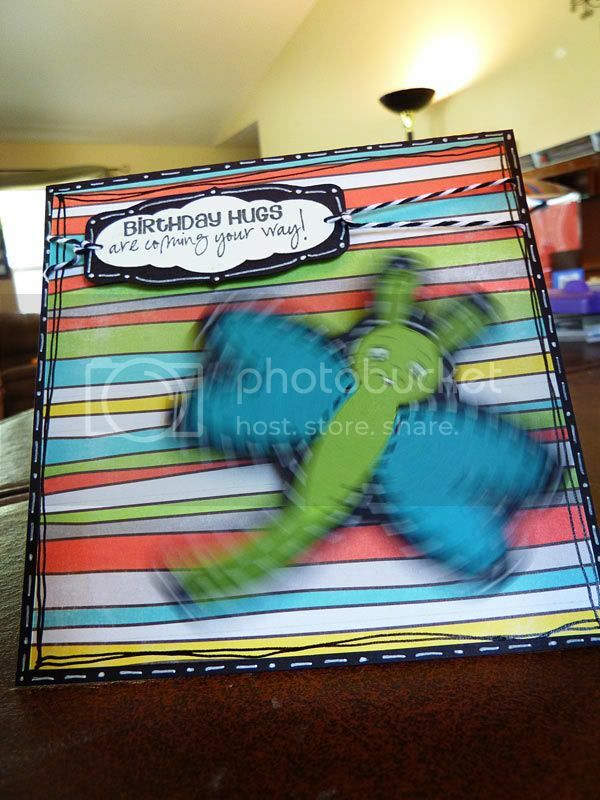 It is a Tic Tac Toe challenge, so I picked the middle horizontal row of elements for this card. I have been curious about dabbling in heat embossing for a little while now, but was reluctant to invest any money in it, in case it turned out to be something that sounded more fun that it really was. However, my mom had all the supplies, and was willing to loan them to me for a bit so I could play. All I can say is...uh-oh!!! I LOVE it!!! Can't stop playing with it, so it looks like I have a new addiction!!! 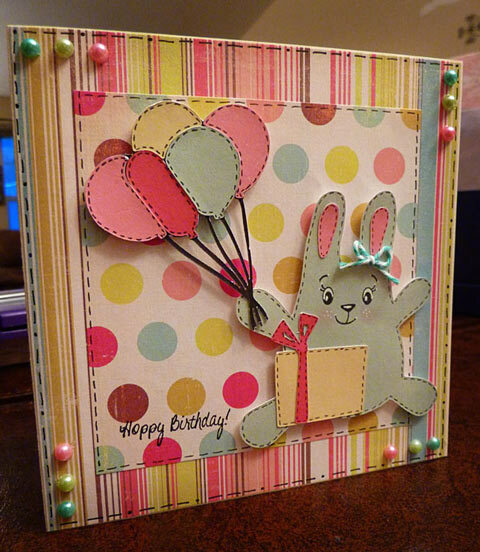 Anyway, yesterday afternoon was my first try at it, and here is one of the cards I made! 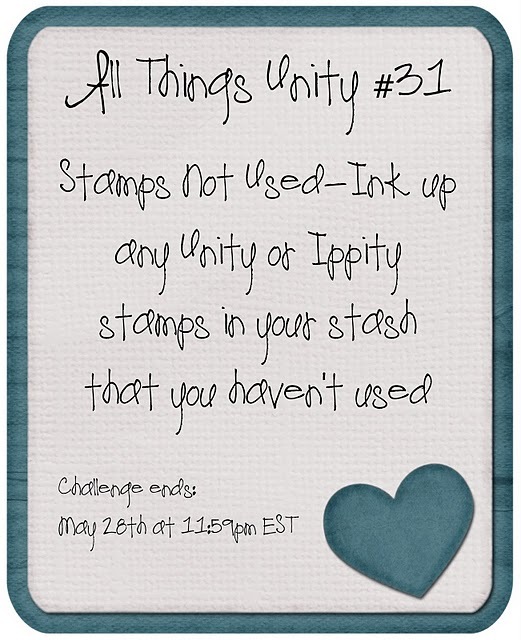 I am also entering this in the All Things Unity Challenge to ink up stamps you haven't used yet. I have way too many of those, so I should be spending a lot of time on this challenge! 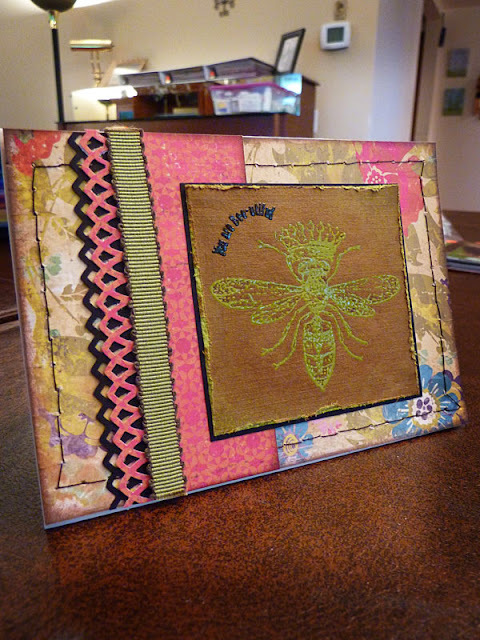 For this card, I used the Unity bee stamp that I got in my Friends with Flair winnings, heat embossed it with clear embossing powder and watermark ink, then sprayed Walnut Ink antiquing solution over it. I then used my Tim Holtz distress tool around the edges, matted it in black, and added a sentiment from an older KOTM, and heat embossed it in black. 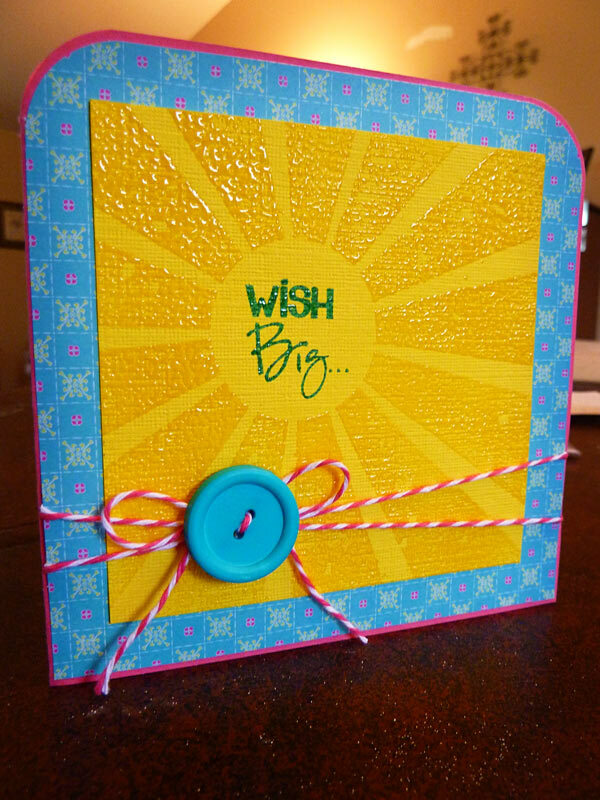 Added some stitching around the edge of the card with my Sew Easy, some inking, a border cut with a Martha Stewart edge punch, and a bit of ribbon. 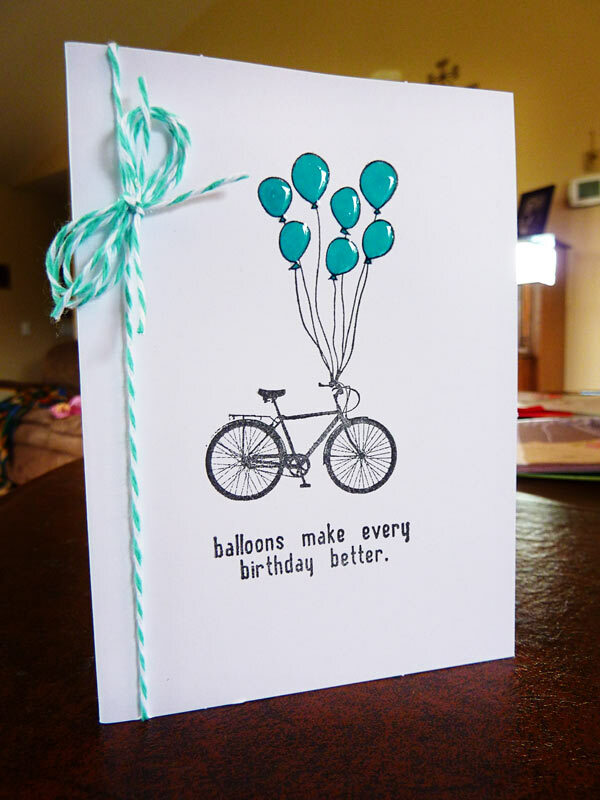 Just a couple more of the simple balloon cards I made recently, and in a couple different colors! The bike with balloons and sentiment are from Unity Stamps, colored the balloons with Prismacolor Markers, topped them with Glossy Accents and added some Baker's Twine on the side to finish. 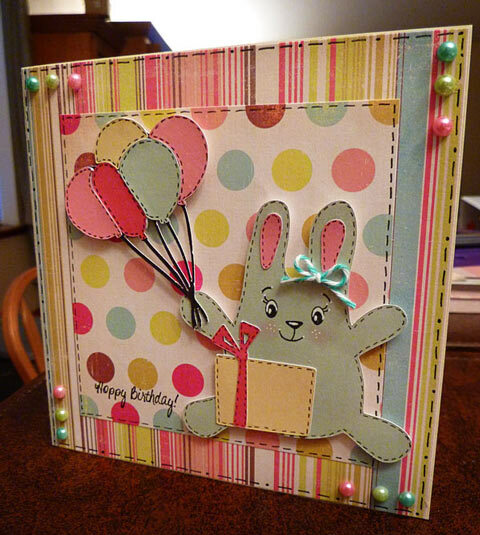 So...now that Blogger is up and going strong again - here is the card I had ready for Unity Stamp Co.'s Friday Friends with Flair! Stamped the tree, and colored some of it with white gel pen. Added some faux stitching and a black jute bow along the bottom. Click on the link to go see all the other wonderful projects!!! Well...I had this all ready to post yesterday...but blogger has been down until now! Still not sure if it is going to work or not, but figured I would give it a try! I made this card for two challenges, and a Design Team call. 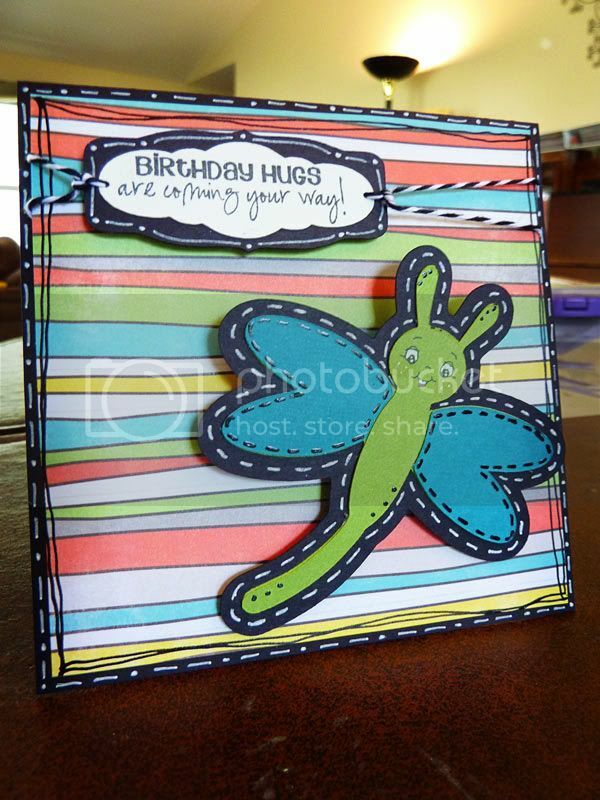 The first challenge is over at Random Flutters From Paper Wings: a birthday themed project. 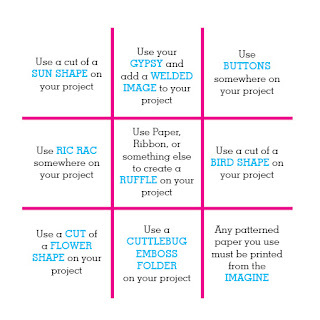 The second challenge is the Throwback Thursday Challenge with Emma: Use Doodlecharms (or an older cartridge if you don't have that one) and incorporate the color blue somewhere on your project. 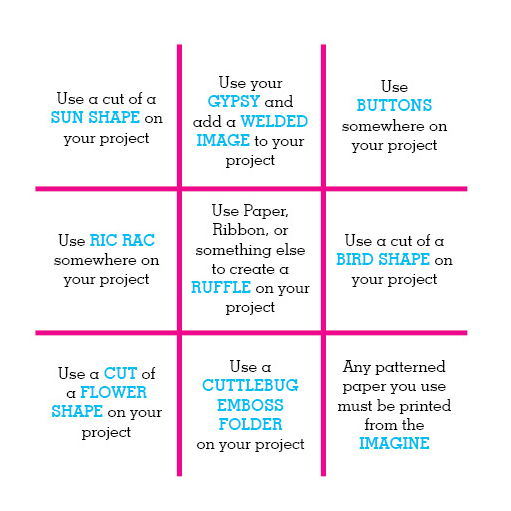 The last item is the design team call at Cricut 360: use lime green and any bug. I am also linking this up with the Patches of Pink Link-up Party! So, since I didn't have Doodlecharms, I decided to use Paisley, which had a dragonfly on it that was similar to one on Doodlecharms. I added a Peachy Face, some doodling, and put him on an Action Wobble. I had a hard time getting a good picture of the wobble, so sorry that it isn't as good as it could be! Hopefully you can picture it without too much trouble! 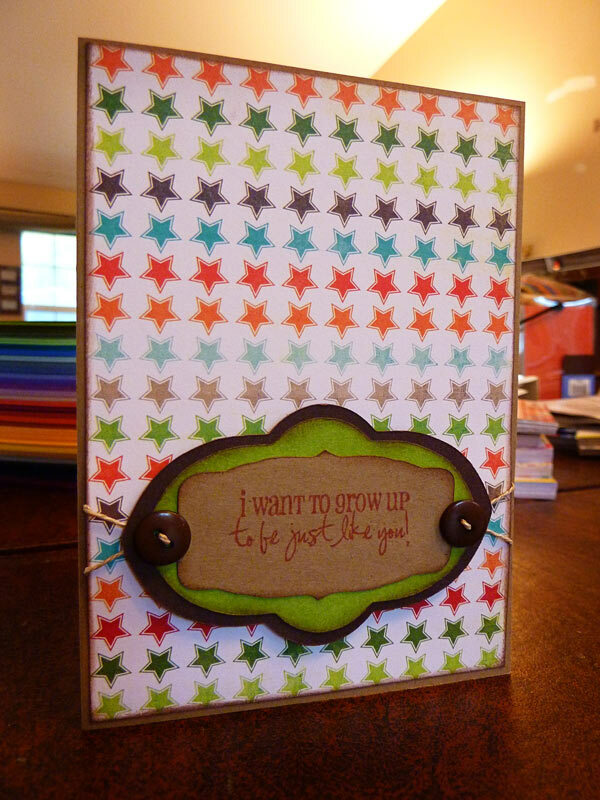 I cut a tag off of Once Upon a Princess, added a sentiment from Emma's My Creative Time Stamps (LOVE theses!!!) and some Baker's Twine. 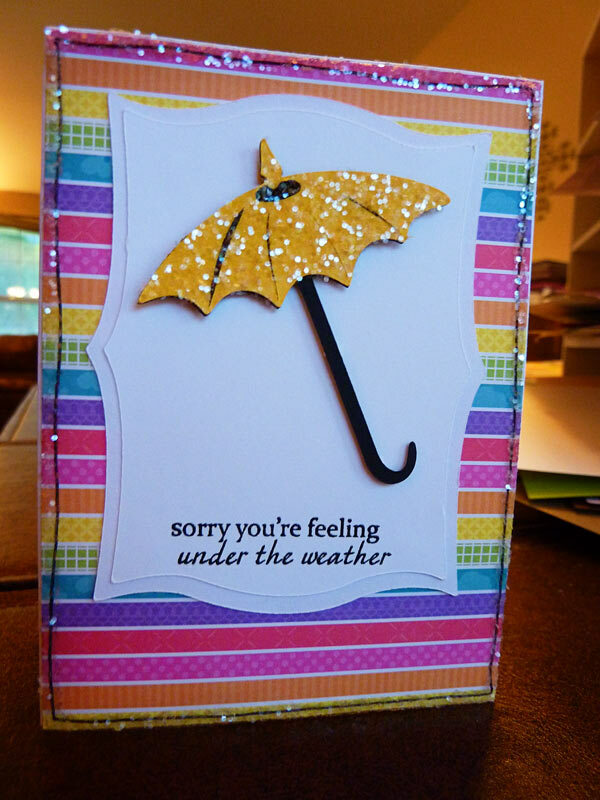 Okay, I know Mother's Day is over, but I have ONE last card to share! 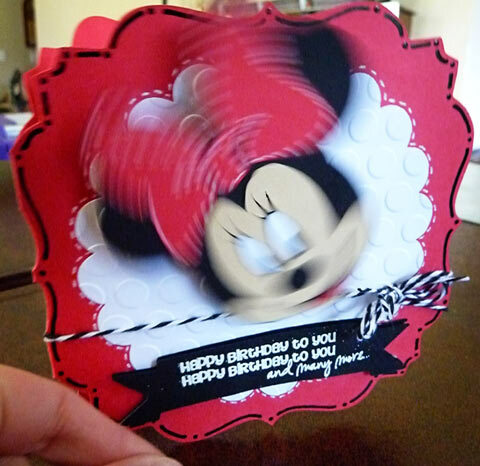 This is the card I made for my Grandmother - she will be 97 years old in July! She has ALWAYS loved strawberries, so I used one of my favorite Unity Itty Bitties to make a card for her. 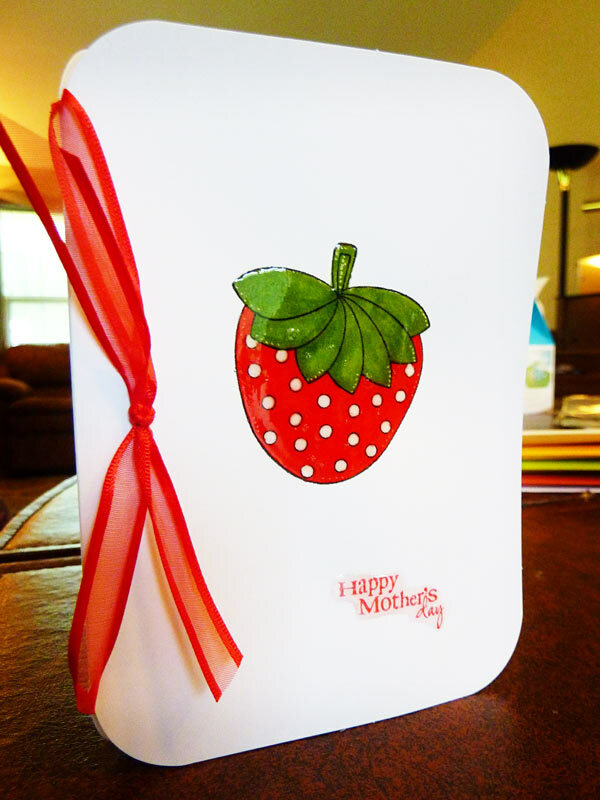 I stamped it on a plain white card, rounded the edges, colored it with my Prismacolor Markers, added a few tiny dots with my white gel pen, and covered the strawberry with Glossy Accents. The picture doesn't show the Glossy Accents very well - I had trouble getting a good picture - but it makes the strawberry look SOOOO juicy!!! Finished up with a sentiment from Emma's My Creative Time stamps (also with a bit of Glossy Accents on it) and a bit of red ribbon. Thanks Mom Blog Hop Winner! 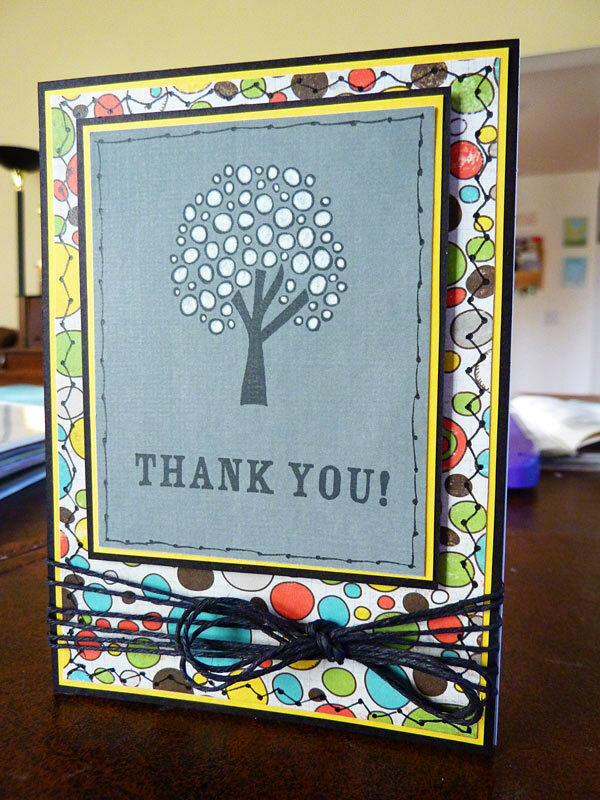 Mother's Day Card for my "Stisters"
Unity Stamps Friends with Flair!!! 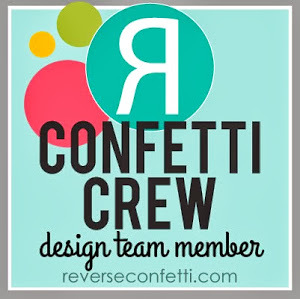 Patches of Pink - Design Team Post!